Make sure your system meets the minimum requirements before installing Automate Schedule Agents on your Windows system. Download the Automate Schedule Agent for Windows file from our website. Double-click the Automate_Schedule_Agent_for_Windows.zip file. The zip file contains the Windows agent installer. Follow the onscreen instructions to start the installation. 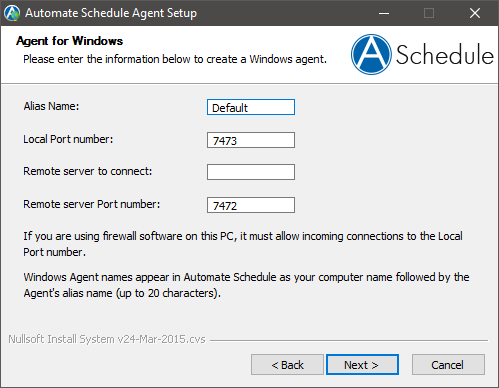 The Automate Schedule Agent Setup window displays. Use this window to create a default agent for the system you are setting up. Enter an alias for the default agent for this system (you can have multiple agents on one system). Enter the local port number (installer defaults to 7473). The "Remote server to connect" to is the IP address of the enterprise server where you installed Automate Schedule. The "Remote server port number" defaults to 7472 during the server installation. If you changed this during server installation, use the port number you entered. Click Next to continue. Follow onscreen instructions to finish the installation. At the end of the install, you are asked if you want to start the Agent Manager. Click Yes. Note: If you want to add additional agents for this system, continue with steps 8-14. Double-click the Automate Schedule Agent Manager icon from the Windows tray. Click Add. The Add Agent window displays. Select Create a new Agent or Create an Agent from a configuration file. If you selected "Create an Agent from a configuration file," click the prompt (...) button to locate the agent configuration file. The Agent Configuration window displays. Set server information, server settings, and local agent settings for this agent. Make sure you use a unique listen port for the local agent settings to avoid conflicts when connecting multiple agents. Click OK. The main window displays, displaying the new agent. After your agent systems are set up correctly, they will automatically appear in the list of agents on the Automate Schedule enterprise server. For information on what to do after you have the agents installed, see Getting Started with Automate Schedule.